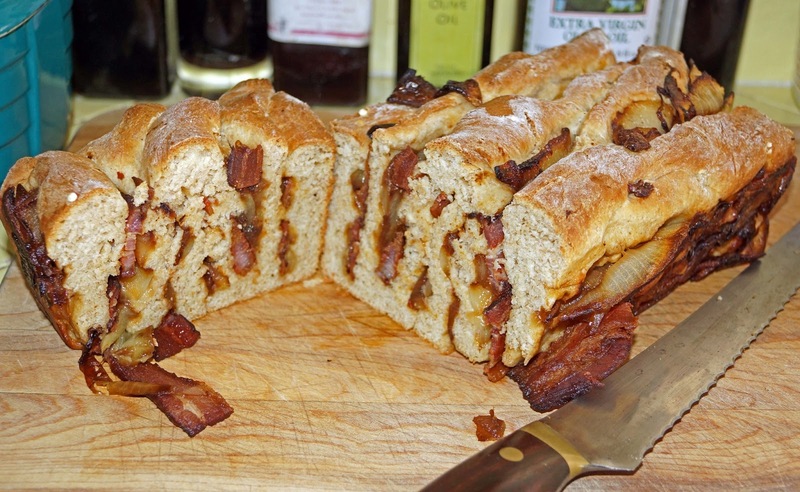 Bacon and caramelized onions all baked into a flavorful yeasty bread sounds scrumptillicious. Image the aromas of onions caramelizing, savory bacon and bread baking all mingling in your kitchen. 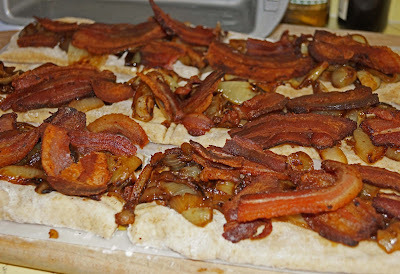 This was the reality when we created this outrageous loaf of bacon love. Decadent, rich, savory, is it just what the doctor ordered? Grab your defibrillator and pull up a hospital gurney while we create this fabulously rich bread. We used a recipe from “Yummly nibbles & bits”. We did make a couple of changes to the recipe to suit our tastes. We omitted all the sugars. Caramelizing onions will bring out natural sugars that will suffice for us. We also did not use sugar in the bread. It will take a little longer to rise but will not sacrifice any flavor. There was also a twist in the assembly of this bread. This was because of my inability to follow instructions. I stacked my slices of uncooked bread in the pan horizontally instead of vertically. It did not change the outcome of the bread except for presentation. Recipes are a guideline not the rule. It is amazing how wonderful onions smell when caramelizing. This was worth the ticket of admission. We did use two yellow onions. They were cooked low and slow until brown and yummy. We used a combination of leftover slab chunks of bacon from the infamous Chilebrown ice cave. 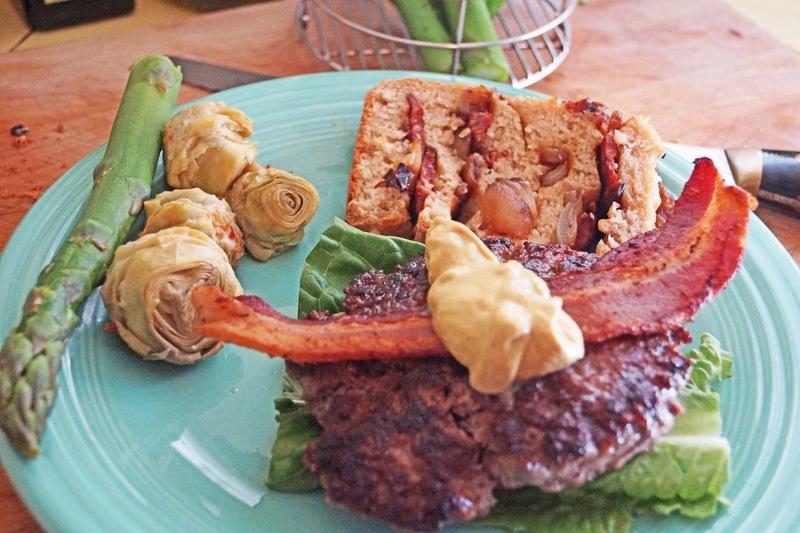 The origin of these bacon chunks were from ‘Archers Butcher Block’ & The Local Butcher Shop. This combination made for a regal addition. We assembled our loaf and put it in the oven. The aroma wafting from the oven was tortuously sinful. It took some patience but we were rewarded soon. Still warm from the oven, this bread delivered everything the smells promised. Sweet with onion flavor, savory/salty bacon crunch all intertwined in yeasty bread. We wanted to go even farther over the top of bacon consumption. A bacon cheeseburger served on Bacon, Onion, Bread did the trick. Oh my gosh!! Oh, baby, I think you've found nirvana! Oh my heavens!! Charging paddles...CLEAR!! I was hoping you were going to make a BLT with this bread but a bacon cheeseburger was just as worthy! That just looks good grief good. Zoomie, Nirvana, great grunge band but I preferred Green Day. Greg, I thought about making a grilled cheese sandwich with this bread. Next time for sure. Three Dogs BBQ, I would love to attend the Word Bacon Championship.Keep us informed of what you enter. Chris, I actually thought of bread pudding but the burger won. Lea Ann, Thanks it was fun. Bread pudding with a bourbon sauce of some kind. Sigh... Good idea Chilebrown.